Provide comfort for the family of Nemesio Manibo with a meaningful gesture of sympathy. It is with profound sadness that we announce the passing of Nemesio Manibo after a battle from illness on February 10, 2019 at the age of 70 years. Nemesio was predeceased by his parents, two brothers and survived by his loving wife Soledad and two sons; Oliver Philip and Jhon Philip. He will be remembered by his numerous brothers and sisters, in-laws, nieces, nephews, grandchildren, and friends. Nemesio is the 6th from 16 siblings. Lamay/Vigil Prayers will be held at Mosaic Funeral Chapel, 1839 Inkster Blvd. on Saturday, February 23, 2019. Lamay will commence at 6:00 p.m. Vigil Prayers will be said at 7:00 p.m.with Monsignor Enrique Samson officiating. Mass of the Resurrection will be celebrated on Monday, February 25, 2019 at 10:30 a.m. St. Peter Roman Catholic Church, 748 Keewatin St, Winnipeg with Monsignor Enrique Samson presiding. Interment will be at a later date in the Philippines. 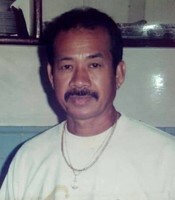 To send flowers in memory of Nemesio Manibo, please visit our Heartfelt Sympathies Store. We encourage you to share your most beloved memories of Nemesio here, so that the family and other loved ones can always see it. You can upload cherished photographs, or share your favorite stories, and can even comment on those shared by others.